What I believe to have been the first recorded strike in history by novelists has ended after ten months in an amicable settlement between the publishing house of W. H. Allen and the Writers' Guild, the TUC-affiliated trade union for creative hacks. How does a novelist take industrial action? Type to rule? Withdraw his adjectives? Insist that all his characters are members of the TGWU ? Refuse to write any book whose hero is not a thinly-disguised Clive Jenkins ? Actually no; he refuses to sign a contract with his publisher, a major act of sacrifice for any budding writer. Ian Rowland-Hill, general secretary of the Writers' Guild, told me yesterday that as a result of a number of writers refusing to accept offers made by W. li. Allen, a division of the Howard and Wyndham empire, basic authors' contracts had now been agreed which were more in line with the rest of the publishing trade. 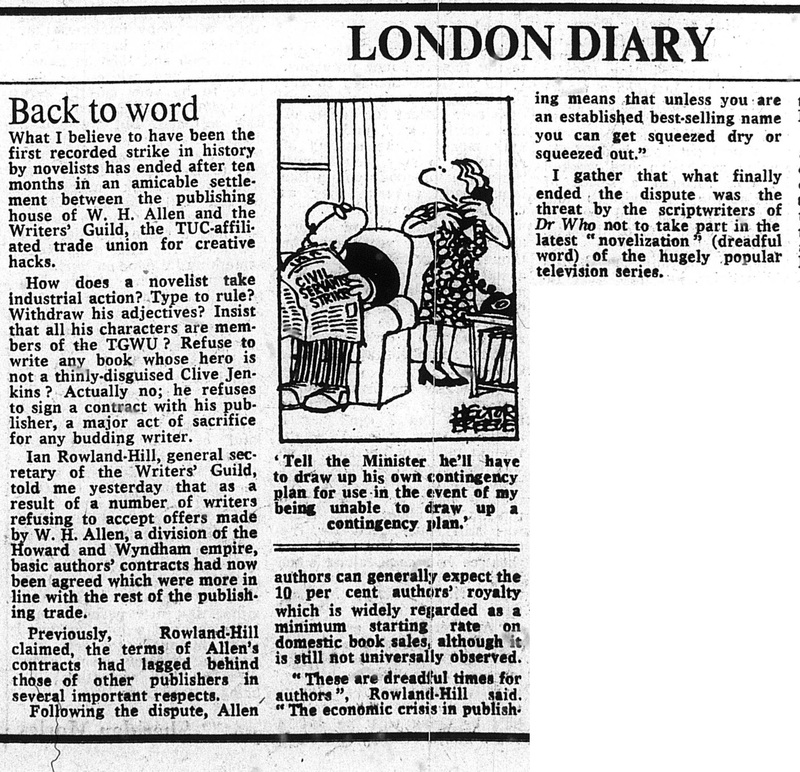 Previously, Rowland-Hill claimed, the terms of Allen's contracts had lagged behind those of other publishers in several important respects. Following the dispute, Allen authors can generally expect the 10 per cent authors' royalty which is widely regarded as a minimum starting rate on domestic book sales, although is still not universally observed.
" These are dreadful times for authors ", Rowland-Hill said. " The economic crisis in publishing means that unless you are an established best-selling name you can get squeezed dry or squeezed out." I gather that what finally ended the dispute was the threat by the scriptwriters of Dr Who not to take part in the latest " novelization " (dreadful word) of the hugely popular television series. APA 6th ed. : (1981-04-15). Back to word. The Times p. 14. MLA 7th ed. : "Back to word." The Times [add city] 1981-04-15, 14. Print. Turabian: "Back to word." The Times, 1981-04-15, section, 14 edition. This page was last modified on 5 August 2014, at 22:38.